In the mid- to late-1960s, Los Angeles, Orange County and San Diego had literally dozens of apartment complexes with a Polynesian design, and a marketing message to prospective tenants that their complex was an oasis, and escape from big city living into a personal tropical hideaway. Tikis, gas-powered flaming torches, tropical foliage, and water features abounded. Not many have survived intact, but it’s not difficult to see hints of them remaining: a lava rock wall here, outrigger beams there, spindly palm trees poking up… the tikis may be gone, but their shadow remains. ZuluMagoo is a man possessed… by a love for Polynesian apartment complexes. 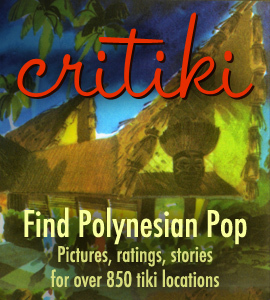 He recently paid a visit to the L.A. County Library in downtown Los Angeles, and pored through the old Yellow Pages looking for suspect names; he’s posted a list of them for local tikiphiles to explore. ZuluMagoo, Sabu the Coconut Boy and others have recently posted a spate of reports from site visits to tiki apartments on Tiki Central, with many lovely pictures, and a few people have been able to dig up original promotional brochures. I won’t link to all the apartment threads in TC here, there are simply too many, but do look for them in Locating Tiki! Can you give more info on tiki apartments? I’ve been looking for something like this. Right now, i’m search for redondo beach apartments on westside rental. I love the tiki feeling to apartments. I have to agree in that the Polynesian design does give you a feeling of being at an oasis.